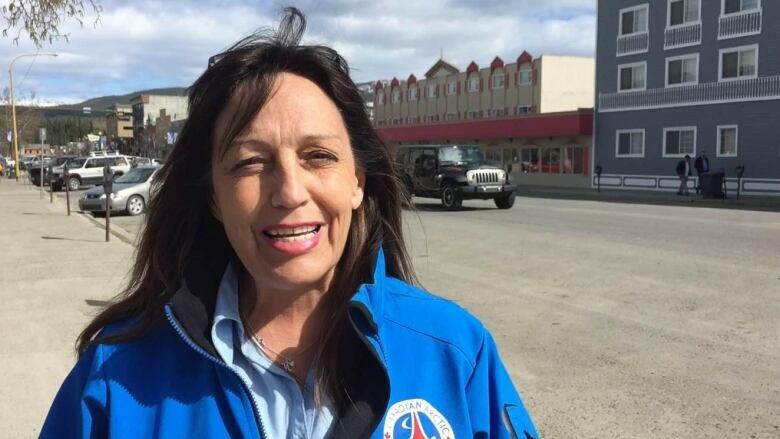 When the Canadian Arctic Aviation Tour was grounded last year, tour organizer Nancy McClure explained that the tour had run out of money to finish. But it appears the tour had been fueled primarily by hope and volunteer money from the beginning. 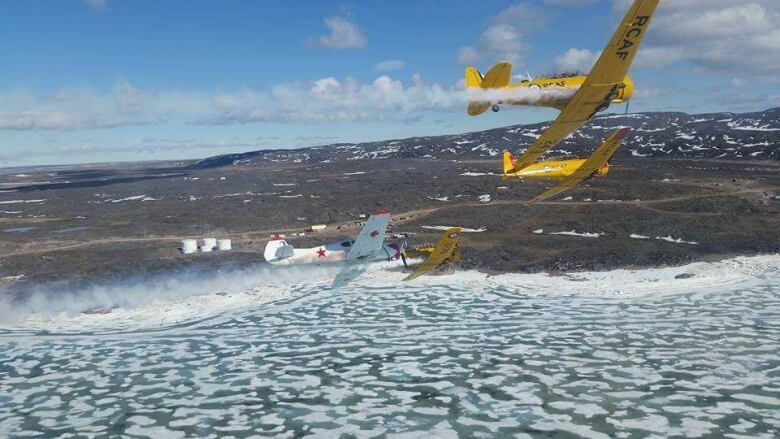 The 2017 Canadian Arctic Aviation Tour delivered on more than 60 of an anticipated 97 air shows and community events across Northern Canada last summer before tour organizer Nancy McClure had to pull the plug on the season saying the tour had run out of money. But at no point did the tour ever have the financial backing it needed to deliver on its ambitious promise, and it left many with unpaid invoices instead of paycheques for a tour that some believed had federal backing. Now, McClure, the executive director of the tour, is hoping those who are owed money will remain patient as she works to raise money needed to pay off debts from last summer's show — and continue with the remainder of the show this summer. In an email to CBC, McClure said the air show needs approximately $2.6 million to "pay all bills and finish the tour in 2018." She declined to specify how much is owed from last year's performances apart from what is needed to continue, or to whom it's owed specifically. She also declined to say how much operating capital the tour had when it got underway last summer. McClure told CBC in an email there are about 15 accounts payable, including money owed to tour organizers and volunteers who lent money to the organization to help keep the show in the air. She said it wasn't until July that she realized she wouldn't be able to pay participants in the tour. But the experience of Susan Close, a Vancouver-based education consultant and retired school board administrator, shows the tour apparently didn't have the money to pay its bills well before any flights got off the ground. Close was contracted by McClure on behalf of the tour to develop the Wings Across the North Literacy Legacy project, with a $25,000 letter of agreement dated Dec.17, 2016. The agreement was to serve as a retainer for Close's services and was signed by Close and McClure with a cheque expected to arrive later in the mail. 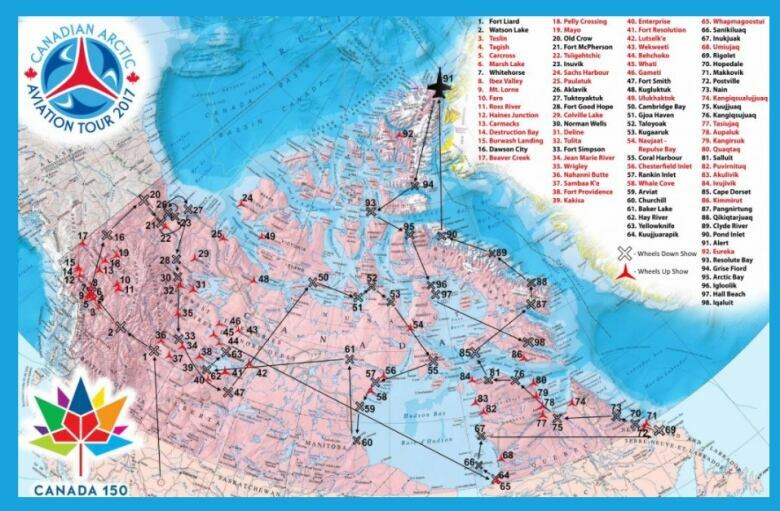 Some thought the Canadian Arctic Aviation Tour 2017 either had federal backing or was near to it, but in reality there was no federal funding. Close said she still chose to arrange a January meeting in Sidney, B.C., with several of the educators who would be part of the project, McClure, and Brian Celli, the tour's director of education and a long-time associate of Close's. After the meeting, McClure wrote the retainer cheque Close and McClure had agreed upon, but the cheque later bounced and Close said she was never issued a replacement. By June, Close had cut ties with the tour. She says the organization owes her approximately $36,000 for work delivered, and related expenses. She said she downplayed the obvious red flag associated with a bounced cheque, and carried on with tour work, largely on the strength of her relationships with Celli and McClure. "I believed Brian [Celli] and Nancy [McClure] when they said it was just a matter of time for the funding to come through, that they had an arrangement with INAC [Indigenous and Northern Affairs Canada] and people in government agencies," Close said. What lent credibility to the promise of federal funding was the timing of the tour. Canada 150 celebrations were underway, and there was $200 million in federal funding available for projects to celebrate the anniversary across the country. As of Tuesday, the tour's website remained branded with Canada 150 insignia, even though the organization ended up being denied any support under the program. 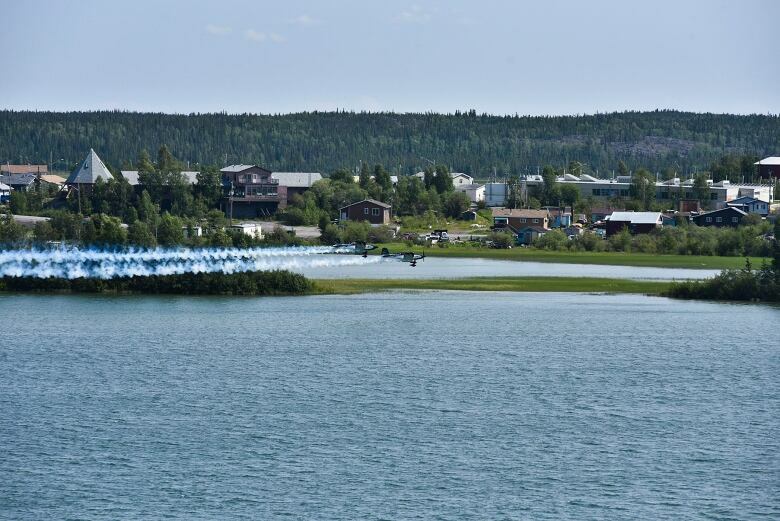 Hunter Wood, a videographer and photographer, says he was contracted to document the air show performances, and put long hours into filming and editing footage over five weeks between June 1 and July 9 in Yellowknife. The remainder of the tour was cancelled days later. Wood told CBC in an email that he never had any reason to doubt he would be paid. "I was always under the impression they were funded by the federal government," Wood stated. "I really didn't ask any questions and put too much trust in them [the tour organizers]." David Bouchard, a Métis author and literacy advocate, was contracted through his agent Chris Patrick to deliver a series of classroom visits in communities the air show was to visit. He delivered on several visits over 16 days of travel in the North, including stops in Yukon, the N.W.T. and Nunavut, but he's not seen any of the $48,000 in fees his agent says he's owed. "Going up North is just magic for him [Bouchard] and the kids … so when the money was said to be available, we jumped in with both feet," Patrick said. "We thought it was part of the [Canada] 150," Patrick said. "It fit perfectly. It just sounded exactly like something the [Canada] 150 would do." McClure does not dispute the tour owes Bouchard for his work. But McClure insists she never misled anyone about the status of her applications for funding. She told CBC she genuinely believed the funding would come through, if not from the Canada 150 fund, then from another federal agency, such as Indigenous and Northern Affairs Canada. "We believed that was going to happen," McClure said. "And that's the only way I can explain it." It wasn't just contractors who believed funding was either on the way or in place. Some close to the organization were also under the impression federal funding was imminent. Celli said he was pretty sure McClure never said federal funding was nailed down, but based on his personal experience of McClure while they both worked in education, he had confidence the money would arrive, so long as the "tenacious" McClure was on the hunt. "I have a fair history of working with Nancy [McClure] on some pretty tough issues and always found that I could rely on her," Celli said. "Basically, I had heard from her that the funding was anticipated." "The overriding message is that, we're expecting the funding imminently." Celli figures he's almost $5,000 in the hole after paying for some tour-related expenses, including airfare and accommodations for Close while she delivered programming in the South Slave Education District. He says he hopes McClure is able to dig the tour out of the hole it's in. "It was a great project, it had so much potential," Celli said. "There are a lot of people … who saw the potential in this thing and were prepared to engage based on the heart — not necessarily from a strong business point of view — but based on the fact that it had the right feel to it." The Department of Canadian Heritage has confirmed McClure's application for funding under Canada 150 programming was not approved, and that the project was not supported, but that because of privacy concerns it could not speak to the specifics of her application. The Department of Indigenous and Northern Affairs Canada (INAC) told CBC the tour first contacted the department in November 2016, but no formal project proposal was submitted until June 2017, when much of the available funding had already been awarded. "INAC officials did, however, review the tour's proposal upon receiving it, and looked at several options for potential funding including through Canada 150," a department spokesperson told CBC in an email. "Unfortunately, the proposal did not meet any of the funding criteria. Tour organizers were informed of the decision later in June 2017." Close says her disappointment goes beyond the money she's been unable to collect. "The tragedy of this story is to make such an incredible promise, get it all started and then just disappear without paying anything," she said. As a former school board administrator, she's astounded anyone would spend money he or she didn't have. "It's hard for me to believe a board chair would not be smart enough to realize you don't contract people when you have no money," Close said. "Who does that?" McClure — who said she herself has lent tens of thousands of dollars to the tour — remains hopeful corporate sponsorship will see value in carrying on with the show and step in to finance the remaining 35 northern performances, but her "priority right now is to pay this year's bills." "I stood up to be a voice for what I felt to be a good project to give something to the people North of 60 who have not had these opportunities, and I stand by that," she said. "We all did this with good intent, it's very sad where we're at right now."